1. Clean out the ashes. A fireplace full of ashes (like an ashtray full of ashes) looks unkempt. You can either scoop ashes with your fireplace shovel into an ash bucket or you can vacuum out the cold ashes with an ash vac. The ash vac has the advantage of cleaning out the super-fine ash dust that finds its way into cracks. Whether you use sweep or vacuum, first open the damper and crack a window in the room with the fireplace. Any airborne ash dust will then be drawn up the chimney as you clean instead of drifting into your room. Wondering what to do with those ashes now? 2. Remove soot and stains. 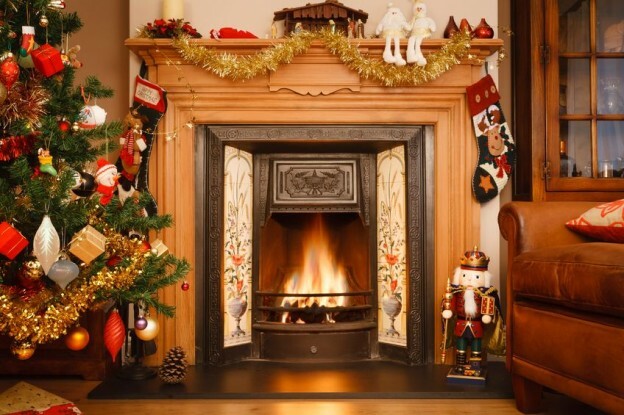 Three areas of a wood-burning fireplace are susceptible to soot and stains: the mantel, the bricks or stones surrounding the fireplace opening, and the interior of the firebox. 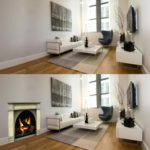 A soot eraser is usually sufficient for cleaning smudges from the fireplace mantel. 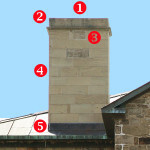 There are two methods of cleaning the bricks surrounding the fireplace and the interior of the firebox. If you are not adverse to elbow grease, click here for cleaning instructions. 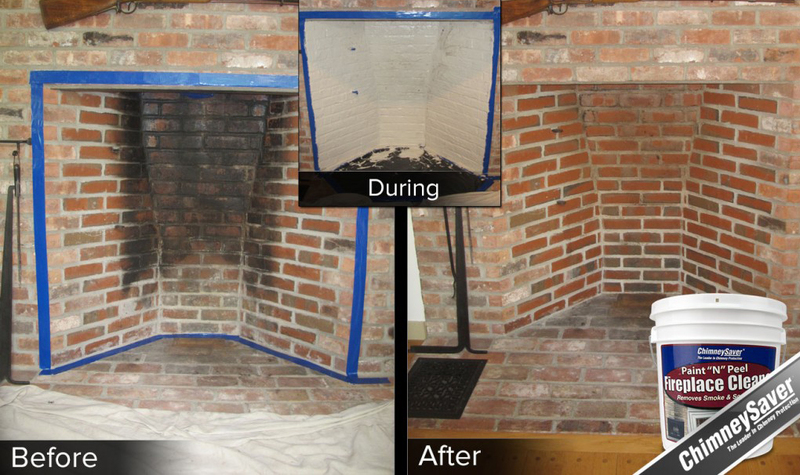 If you would prefer a no-scrub method, we highly recommend Paint N Peel, a product specifically designed for professional chimney sweeps to use to clean inside and around the fireplace. Paint on a thick layer of Paint N Peel, let it dry thoroughly (usually 24 hours, depending on the humidity), and then just peel it off. As you peel it away from the fireplace, the soot and stains are lifted from off the surface and from inside cracks. Before and After photos courtesy ChimneySaver, the manufacturer of Paint N Peel. 3. Shine the slate hearth. Sweep the area right in front of the hearth. If you have a slate hearth, wash and dry it and then wipe it down with lemon oil for a pristine shine. See directions for cleaning a slate hearth here. 4. Create order on the hearth. Everything from fireplace gloves and matches to newspapers, kindling and logs can end up dominating the hearth and detracting from the beauty of your fireplace. 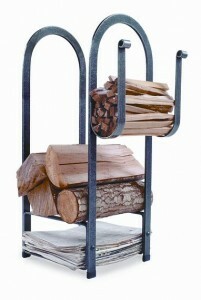 Log holders with storage shelves control that clutter. Containing all the fire-making supplies in one tidy accessory is a great way to spruce up a fireplace for Christmas or any other time of the year. 5. Remove clutter from the mantel. Before you decorate the mantel for Christmas, get rid of any clutter that might have accumulated there. You know: the things that ended up on the fireplace mantel simply because they were in your hand and the mantel was the nearest surface. 6. Fill the fireplace with fire. Now build a welcoming fire in your fireplace. Nothing says “welcome” to holidays guests like an inviting fire in the fireplace. 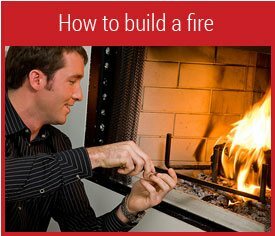 Read fire-building tips here. If, however, you don’t burn firewood in your fireplace, insert a fireplace candelabra with candles into the firebox. 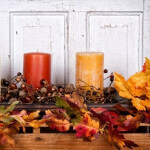 When the candles are lit, you get all the hospitality of a fireplace fire, but with candle light instead of firelight. Whether you are awaiting Santa or other holiday guests, a clean, orderly fireplace and hearth is an instant face-lift for the whole room. In addition, both Mr. and Mrs. Claus appreciate your ash-free and soot-free fireplace.